Today we can watch the news at any time, from any place. ‘News on demand’ is one of many aspects of the digital revolution that is changing news production and distribution as we speak. 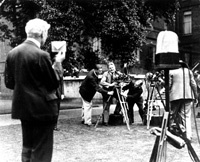 In the late 1920s news production was on the cusp of a similar technical development which would dramatically change the way it was made and seen. This new technology was sound and one of its earliest adoptors was the newsreels. Back in 1928 when David Lean was working at Gaumont’s studios in Lime Grove, the only way to see the news was in a cinema. Films were silent at this time, shown with titles and generally accompanied by live music. The news was shown before the main feature as a newsreel, a short programme of topical stories lasting around ten minutes. Different cinemas generally showed one of the five major newsreels such as Pathe Gazette or Gaumont Graphic. These programmes were only changed twice a week, on Mondays and Thursdays. The first sound newsreel was released by British Movietone in June 1929. It was greeted with excitement and wonder by audiences around Britain, echoing people’s reactions to the first moving pictures three decades earlier. The focus of this first issue was the Derby, an annual horse race at Epsom. The papers marvelled at the thud of the hooves on the turf, the multitude of voices that could be heard around the track and analysed at length the quality of reproduction. Although poor by today’s standards, people flocked to the few ‘wired’ cinemas in Britain to experience this ‘new’ reality. Competition between the newsreel companies to make their own sound version of the news alongside their silent one started in earnest and the production of these two editions would last several years. The technology was in its infancy, and new types of sound production and reproduction equipment coming on the market had adopted no clear standards. No one was sure whether this was a fad or the future and they hedged their bets accordingly.